A team of ten cyclists has taken part in a 37-mile bike ride around the local area. 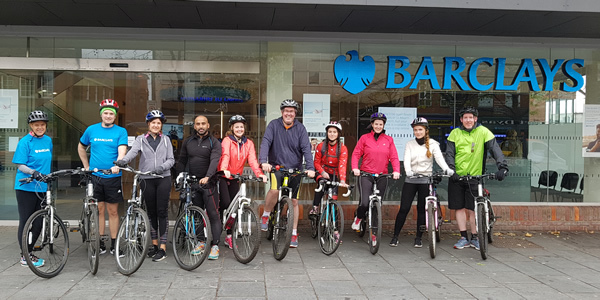 On 9 November they cycled from Luton to Welwyn Garden city, Hatfield, St Albans, and Harpenden, before returning to Luton. They raised money for two charities, and Barclays will double the money raised for the foodbank from £634.18 to £1,268.36. The event was organised by Barclays. Having worked with Luton Foodbank before, they wanted to raise some money in the approach to Christmas. The participants are pictured outside Barclays St Albans.